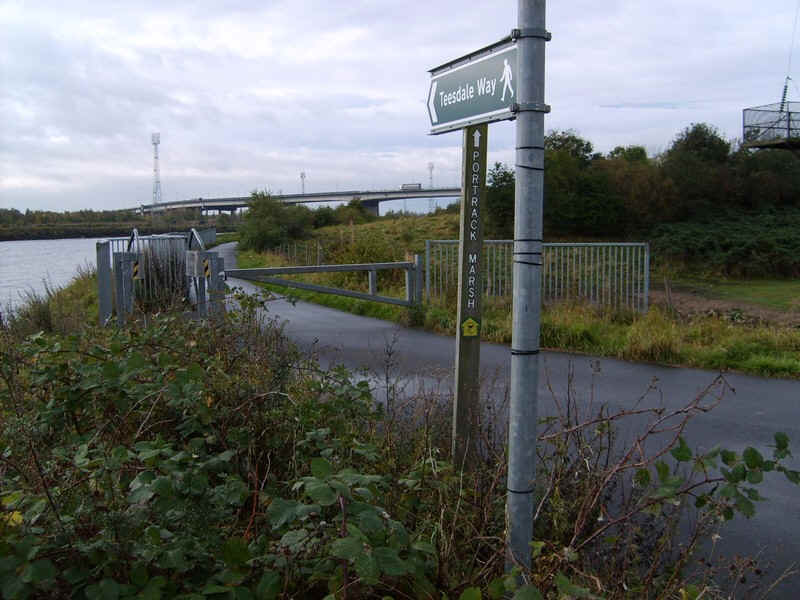 The second stage of the Teesdale Way continues beyond the Transporter Bridge at Middlesbrough to Eaglescliffe. 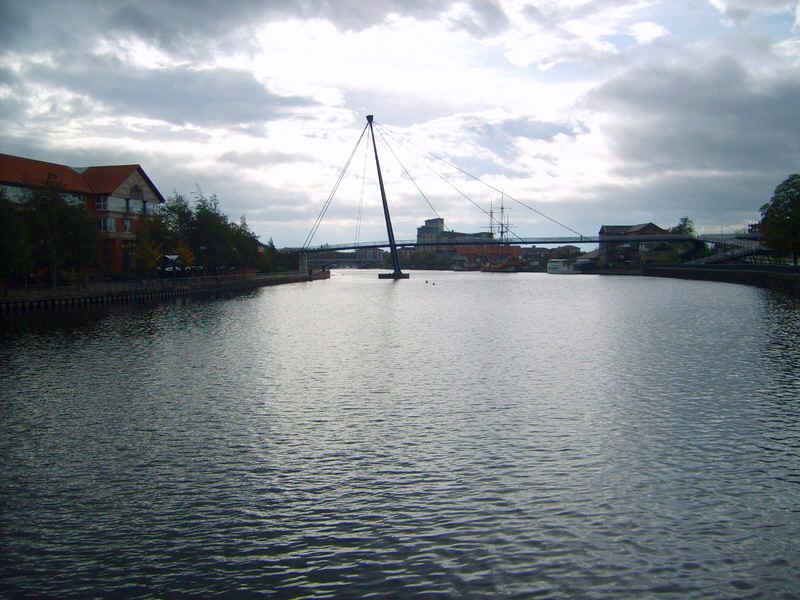 Here the transporter's carriage is seen suspended from the cables as it crosses the Tees. 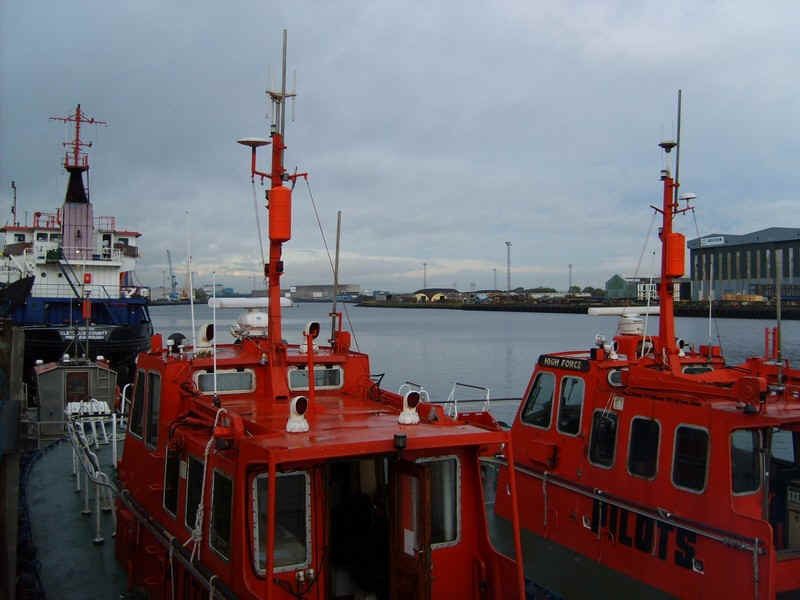 This is the view looking up river from the bridge, with pilot boats awaiting the call of duty. 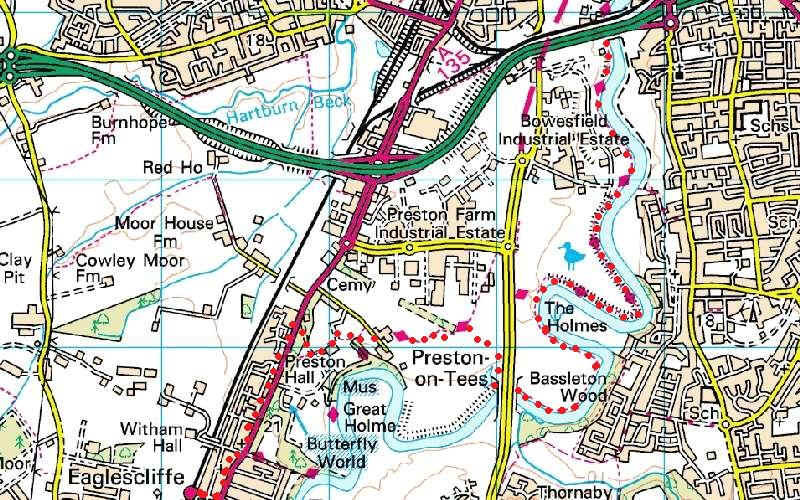 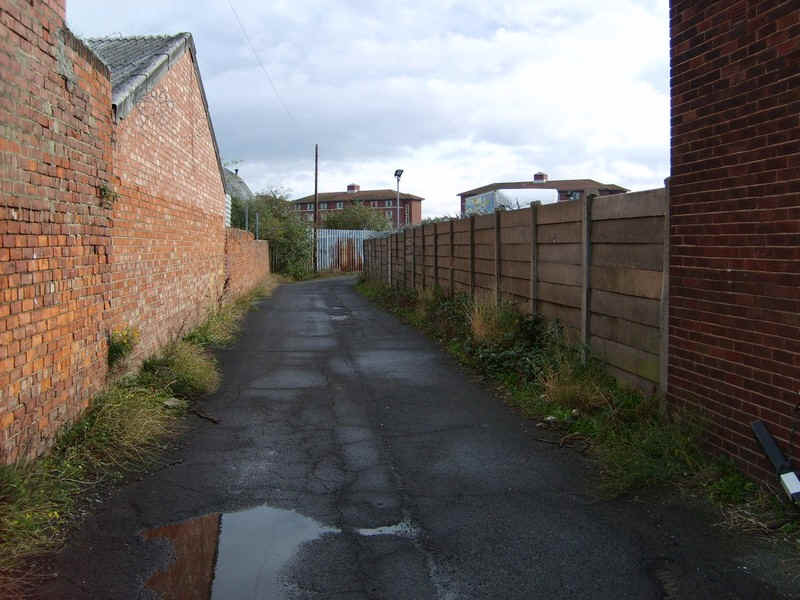 The Teesdale Way continues for some distance through the streets of the industrial estates in north Middlesbrough. 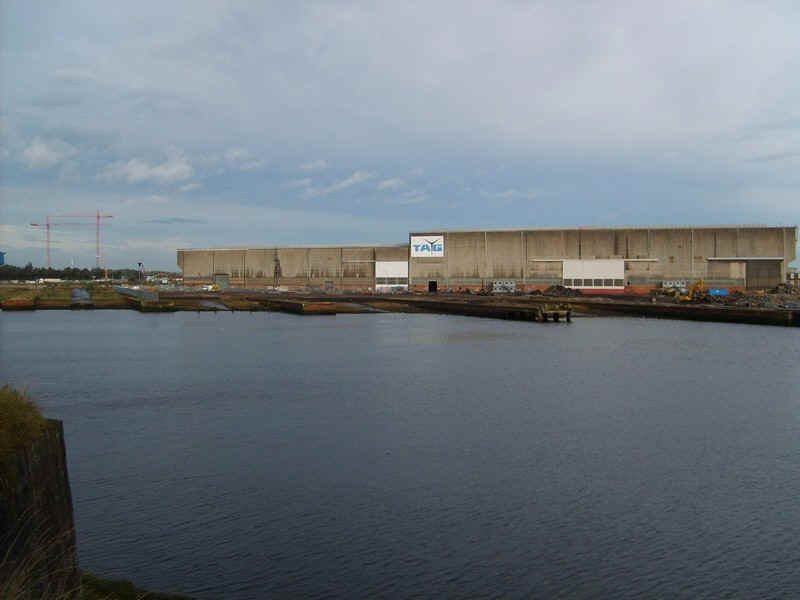 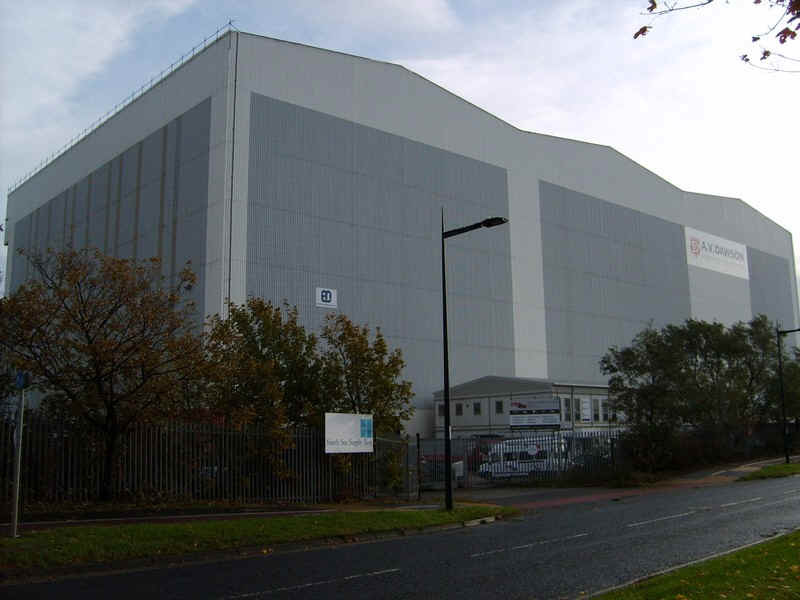 This enormous building is connected with engineering for the North Sea oil industry. 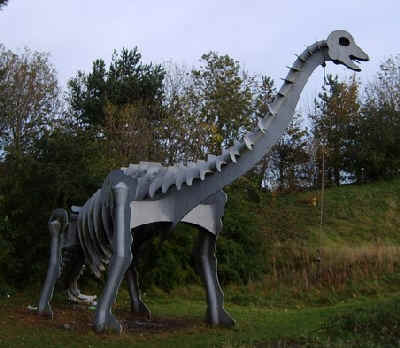 .....where there is a collection of sculptures of dinosaurs. 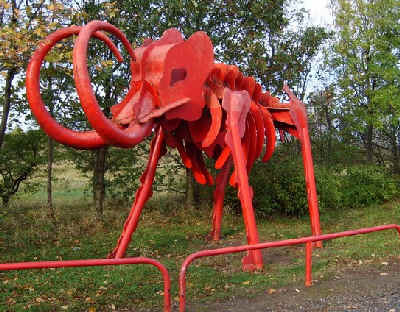 Quite what they symbolise I've no idea. 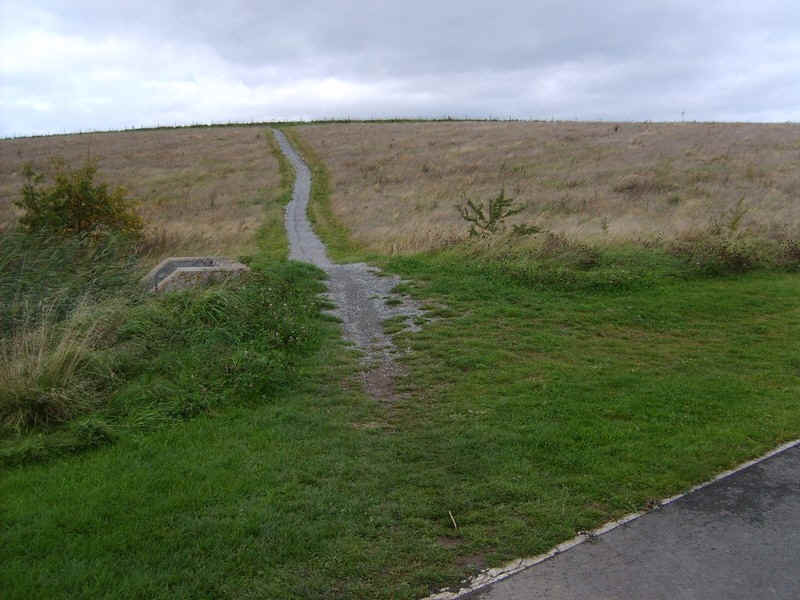 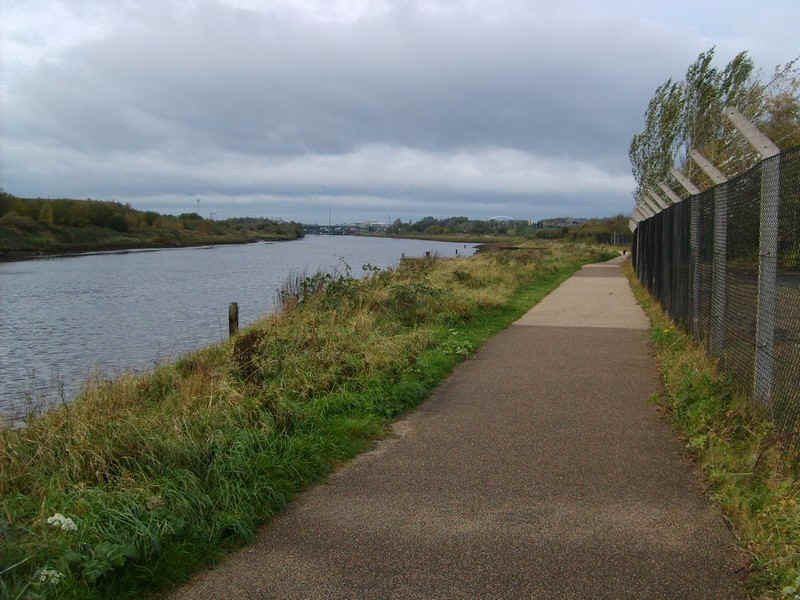 Immediately beyond the park, a riverside path is reached with the derelict slipways of the old Haverton Hill shipyards visible. 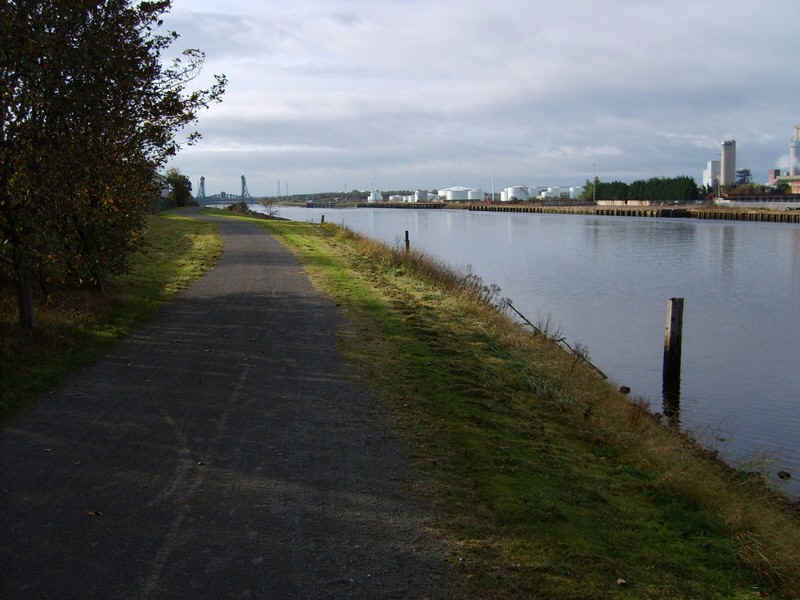 The area to the west side of the riverside path was once known as the Ironmasters' District. 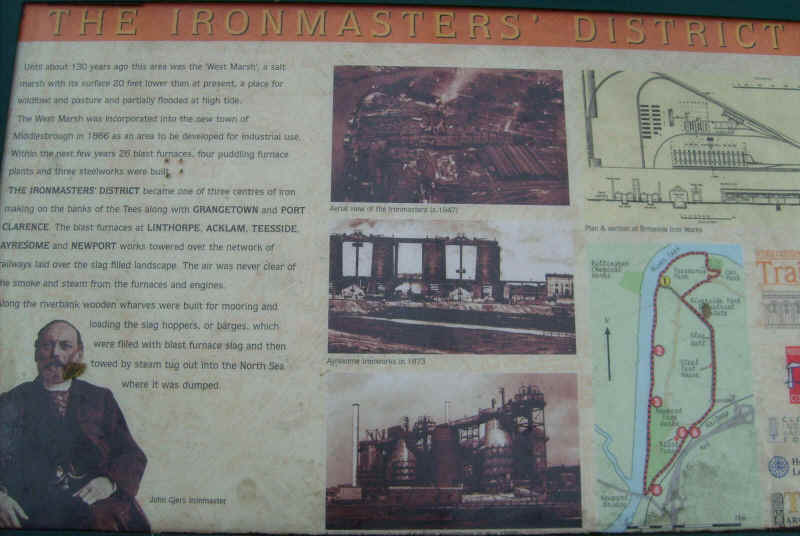 To read more click on the photograph for a larger image. 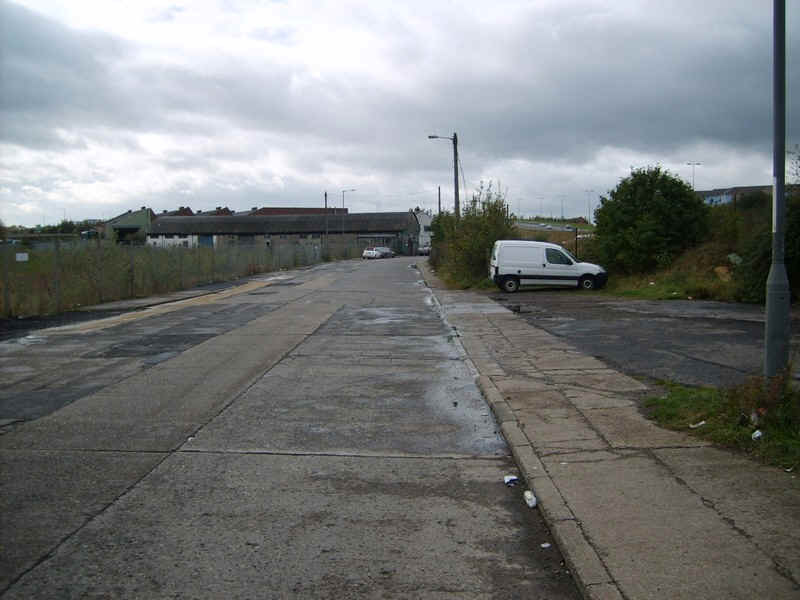 All of this has now disappeared to be replaced by light industry of various sorts. 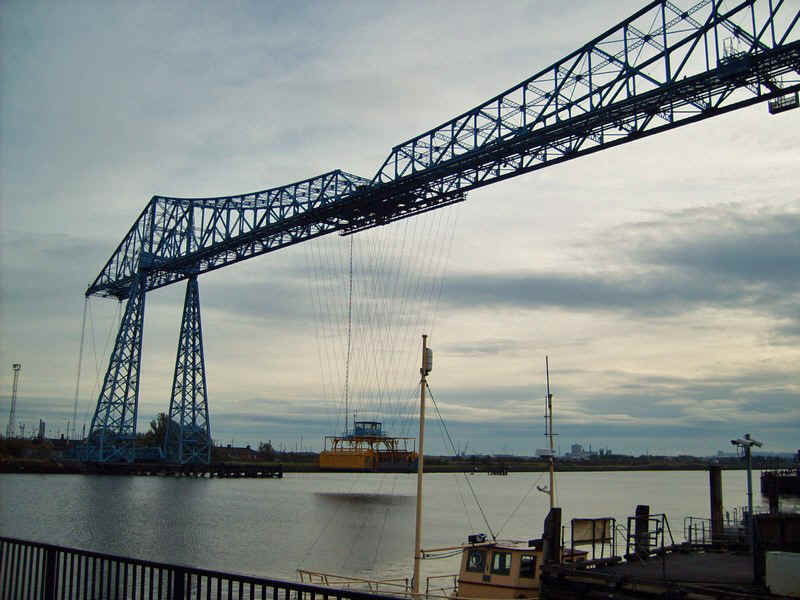 The next bridge over the Tees comes into view - the towers of the Newport lifting bridge can just be seen. 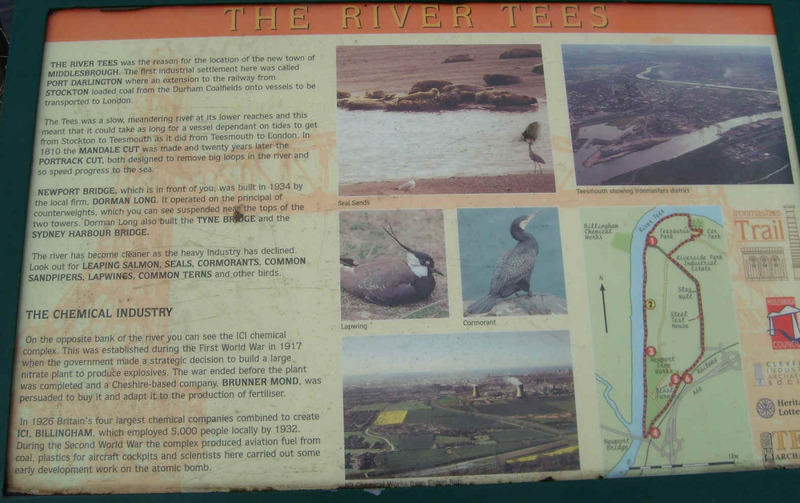 More information about the Tees can be read by clicking on the photograph. 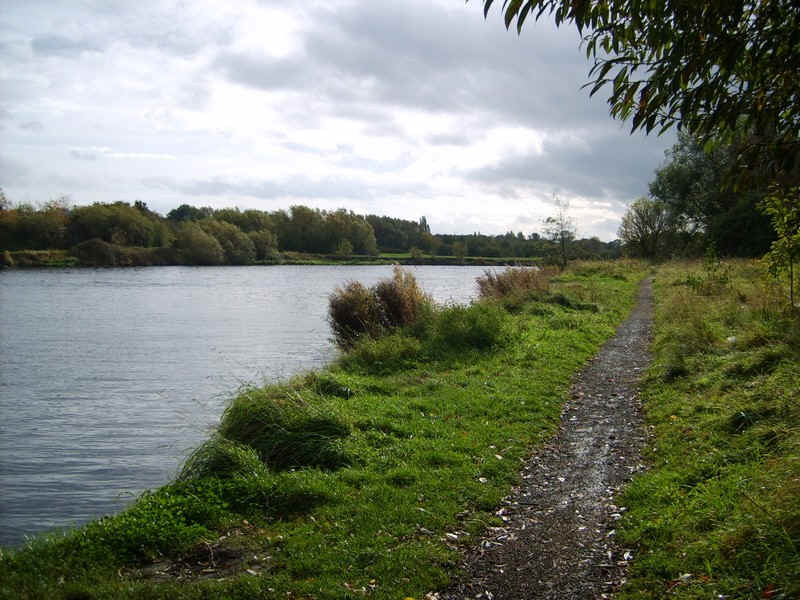 There's a lot of bird life to be seen on this stretch of the river. 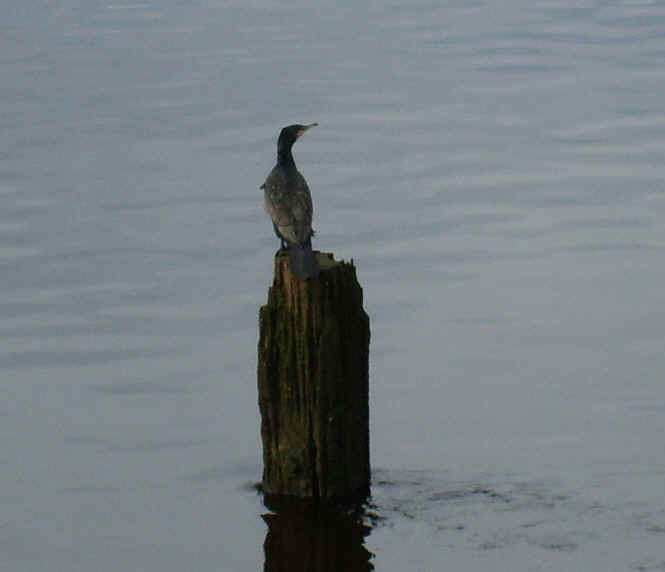 This is one of several cormorants that I saw. 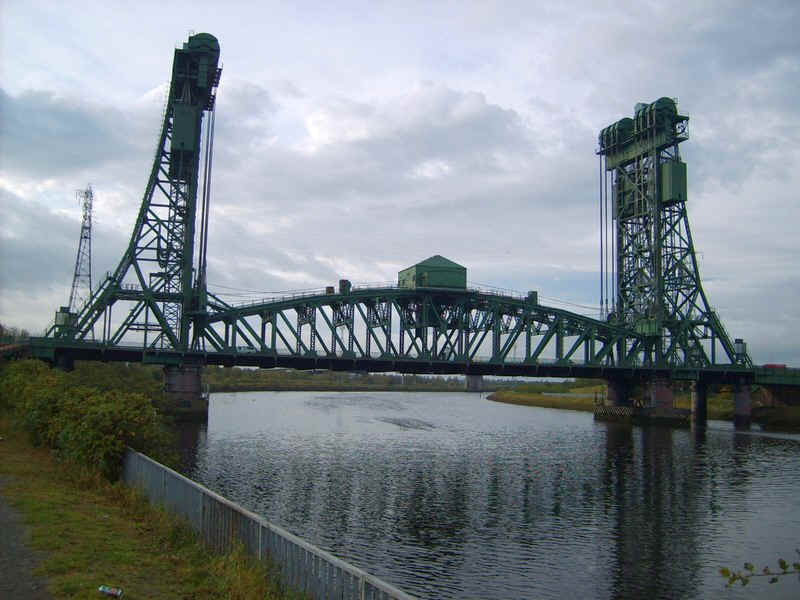 The Newport Bridge - the lifting span is now permanently fixed in position. 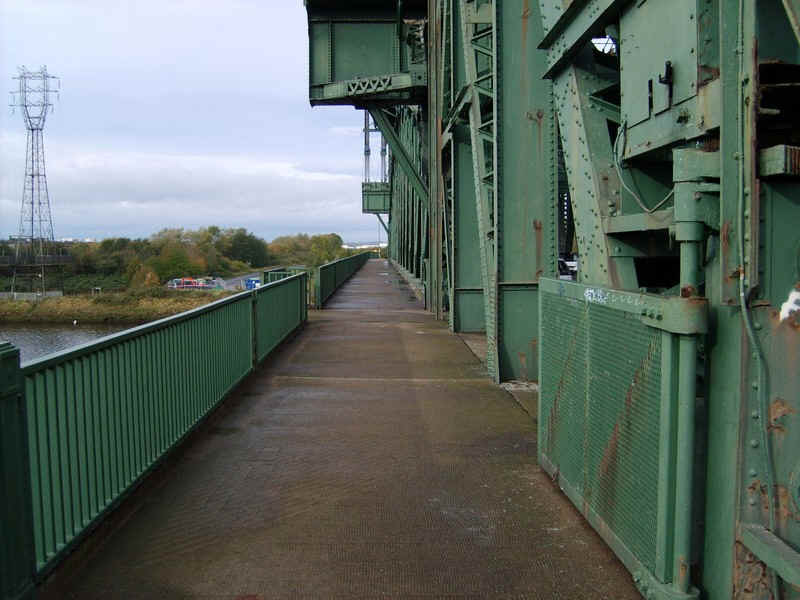 ....and climb the staircase to reach the path over the bridge. 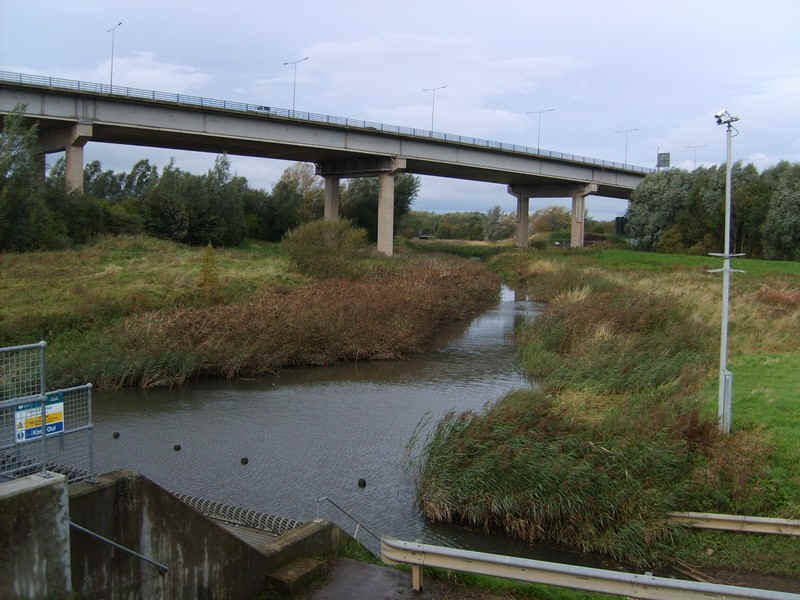 Bridge number three over the Tees is the A19 bridge. 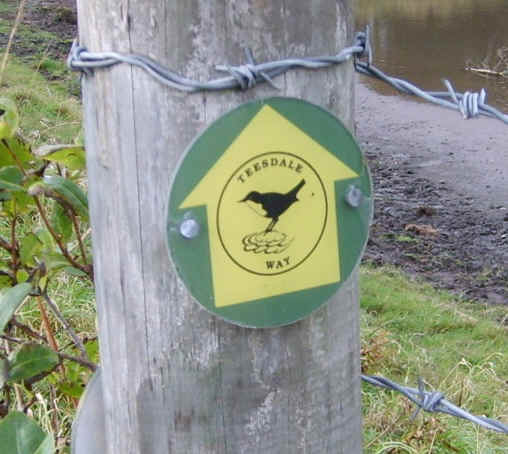 ....and the first of the Teesdale Way emblems. 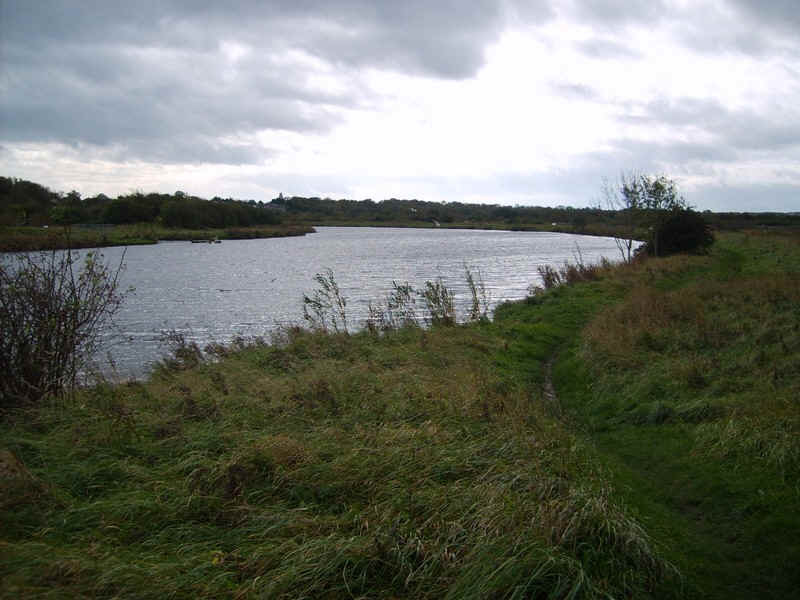 This area is known as the Portrack Marshes and the Lustrum Beck flows into the still tidal Tees at this point. 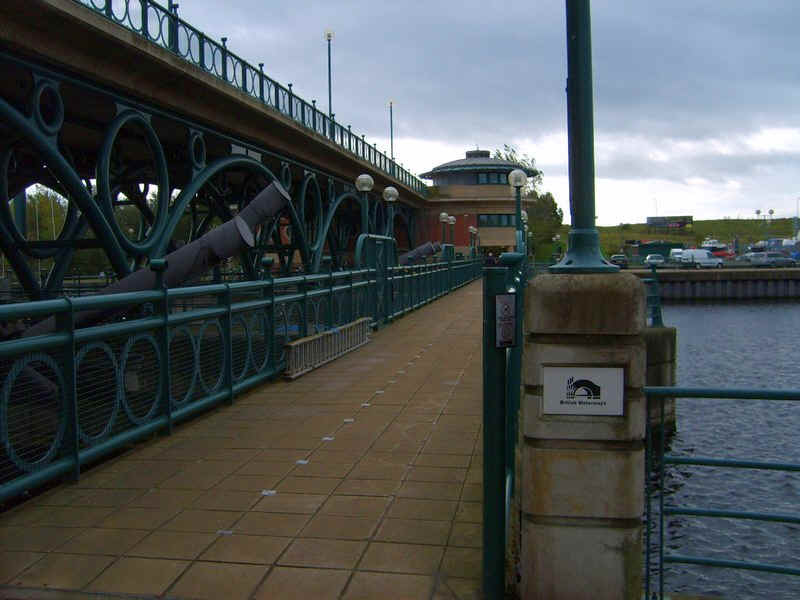 .....with its lock gate on the left and arched road bridge. 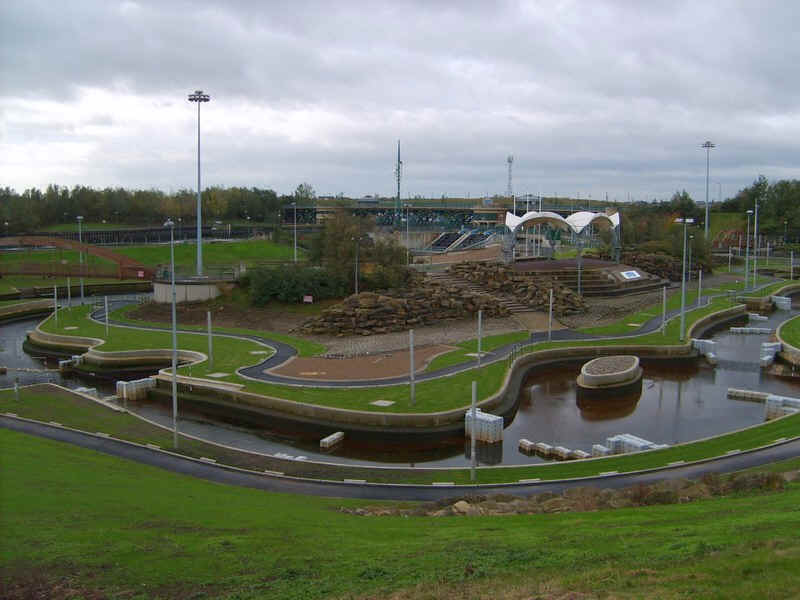 The barrage water sports centre was clearly having a rest day with no wild water for canoeists. 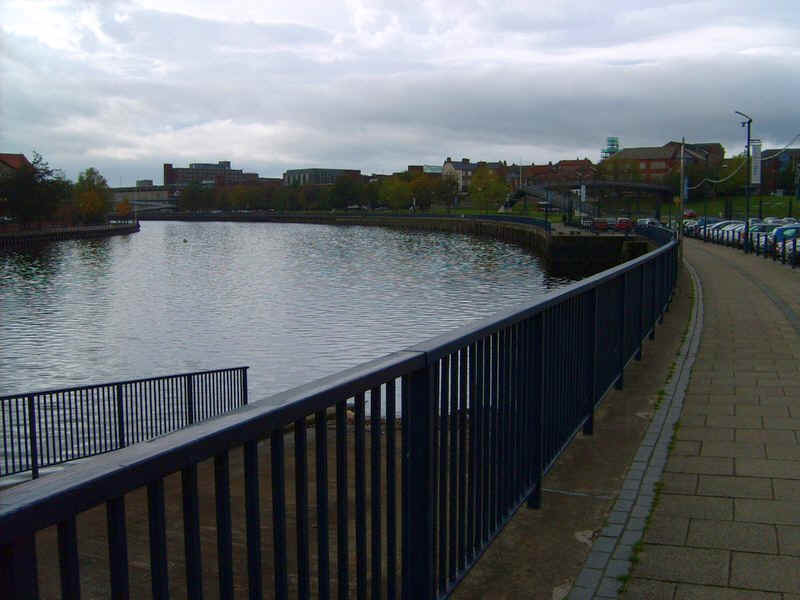 The barrage has a pedestrian path just upstream of the main bridge. 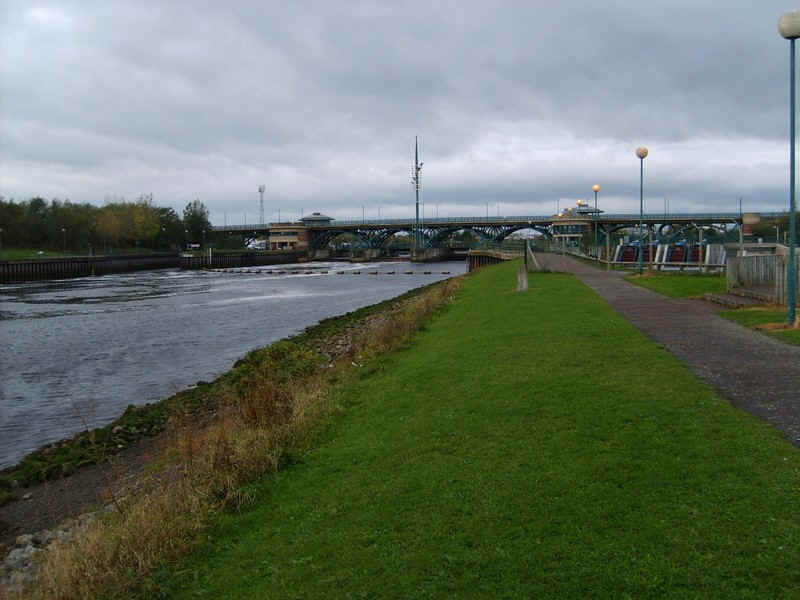 Above the barrage the Tees is now kept at a constant level. 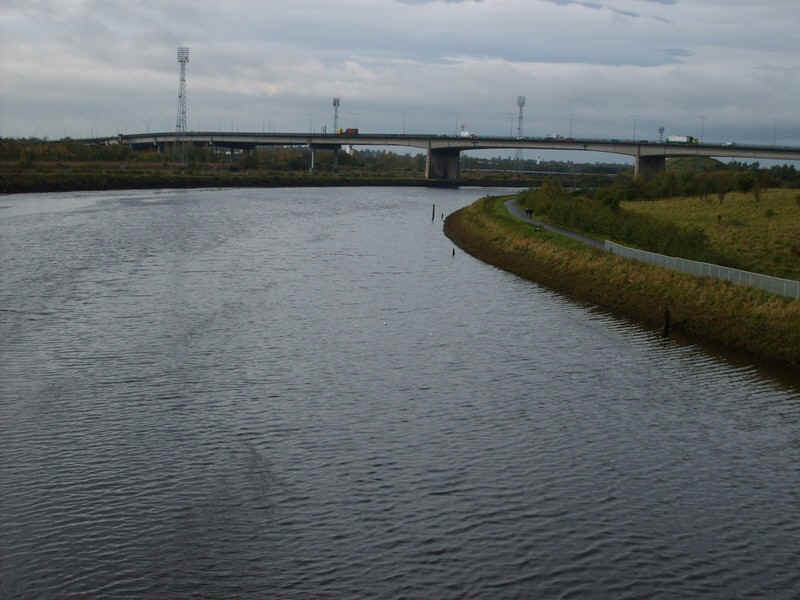 Looking upstream towards Thornaby and Stockton. 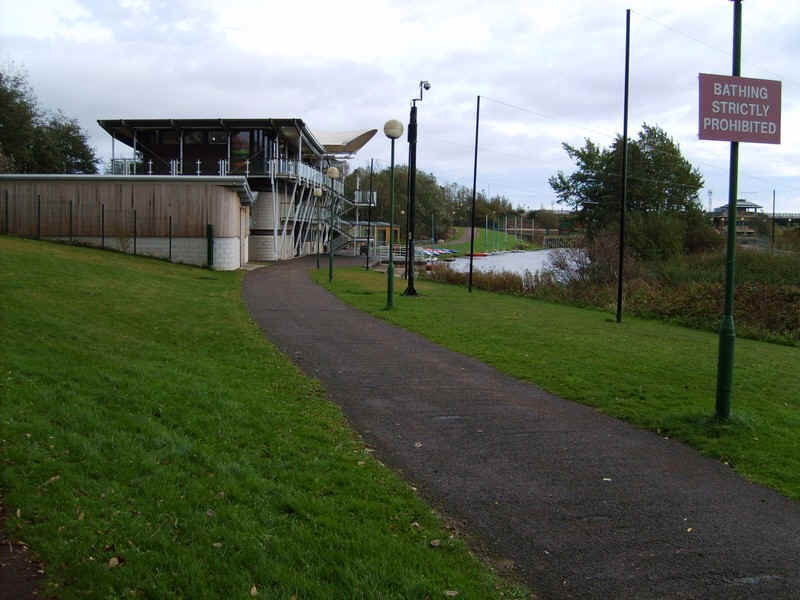 There is a water sports changing centre (with toilets) and a cafe just above the barrage. 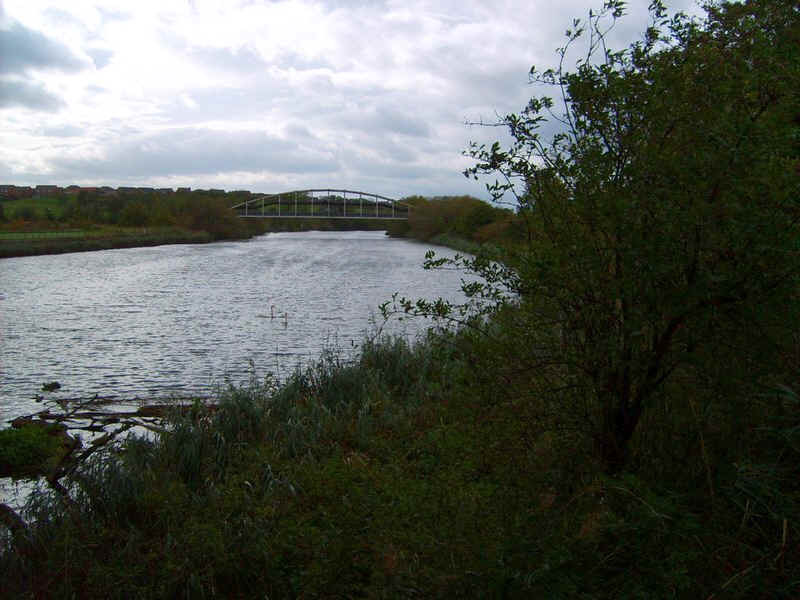 Interest is now centred on the new Infinity Bridge over the 'Old Cut' and links the University of Durham's buildings with the opposite bank. 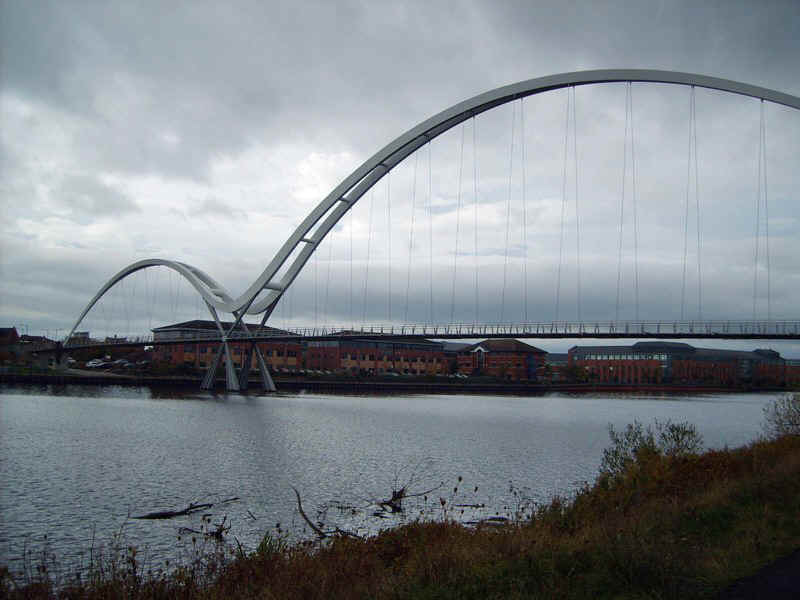 The reason for its name if that the reflection of the bridge together with the bridge itself form the infinity symbol. 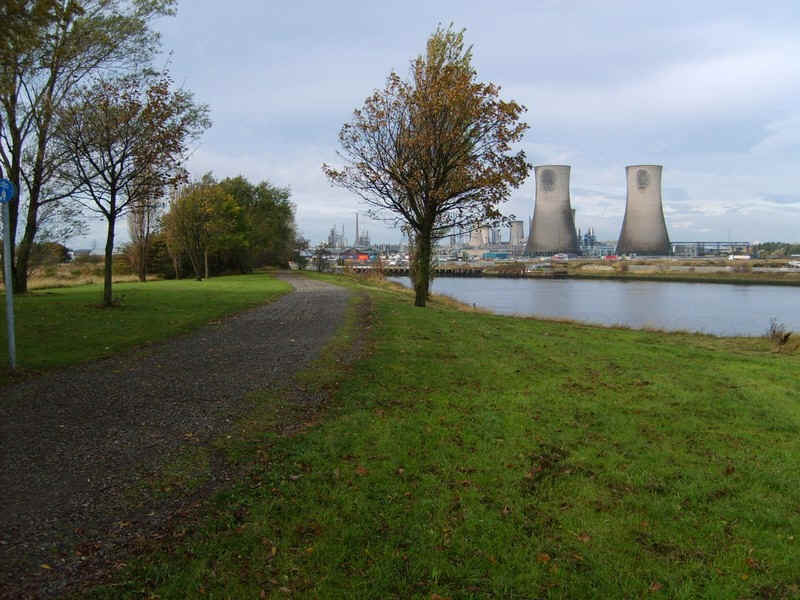 Further upstream the new buildings of Teesside's service sector dominate the river side. 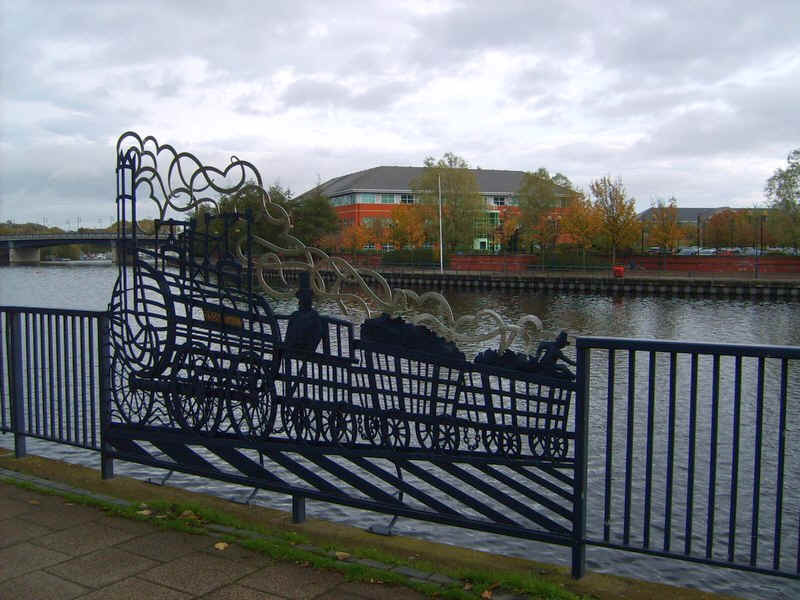 .....with a reminder of Stockton's early industrial history - the Stockton and Darlington Railway. 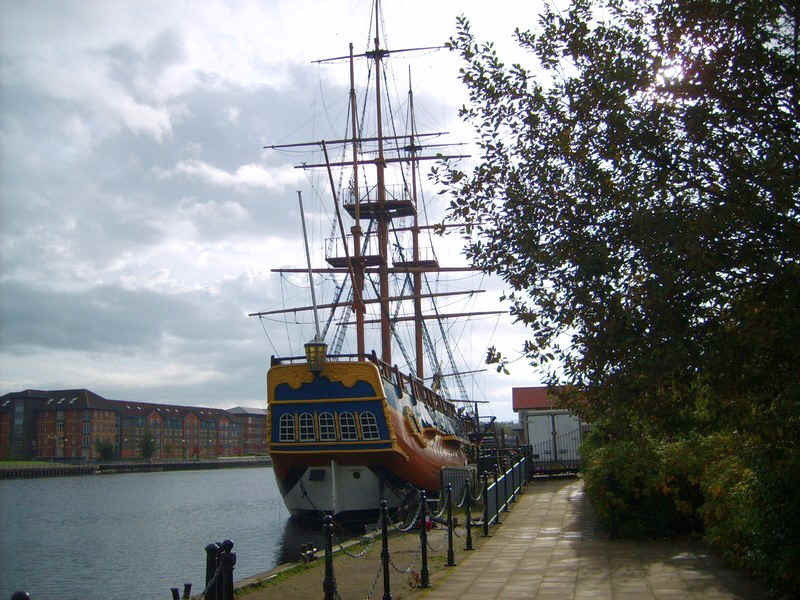 Moored at the quayside is the replica of Captain Cook's ship the HM Bark Endeavour. 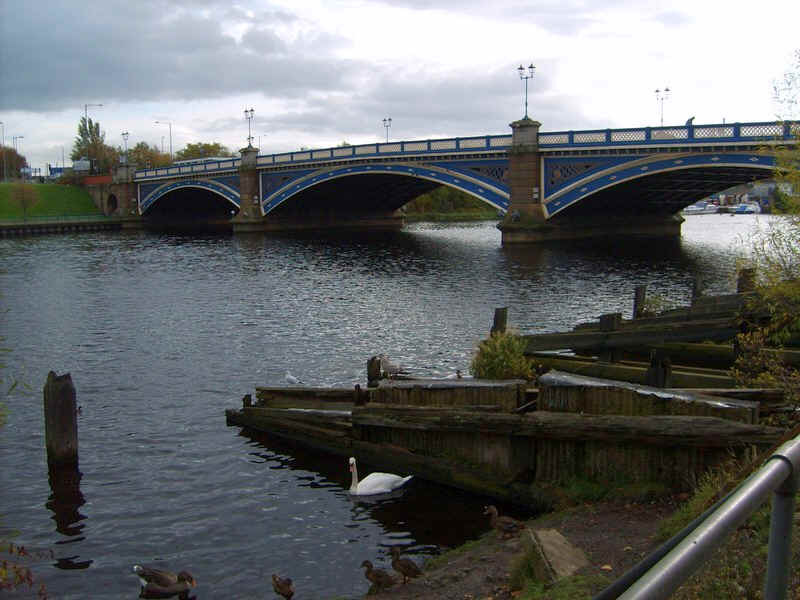 The Victoria Bridge links Thornaby, on the left, with Stockton. 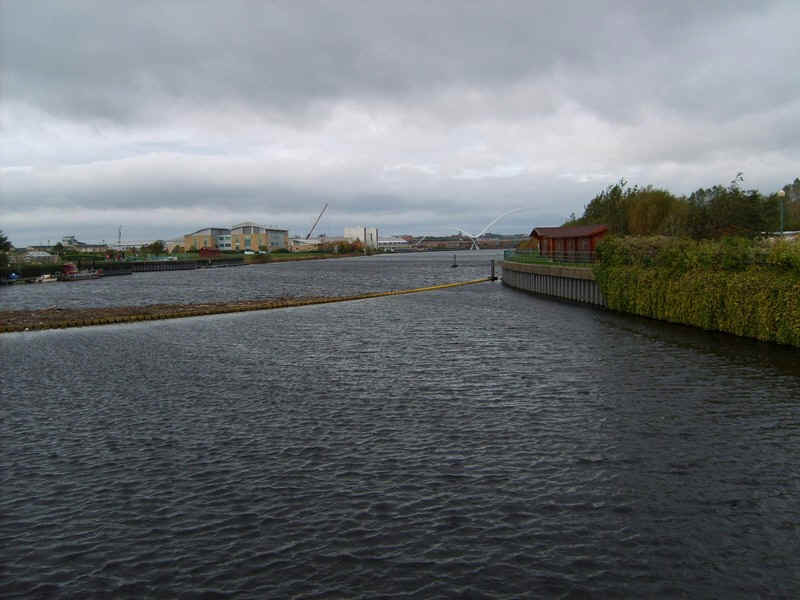 Note the rotting remains of some of the wharves; this was the highest point that could be reached by ships on the Tees. 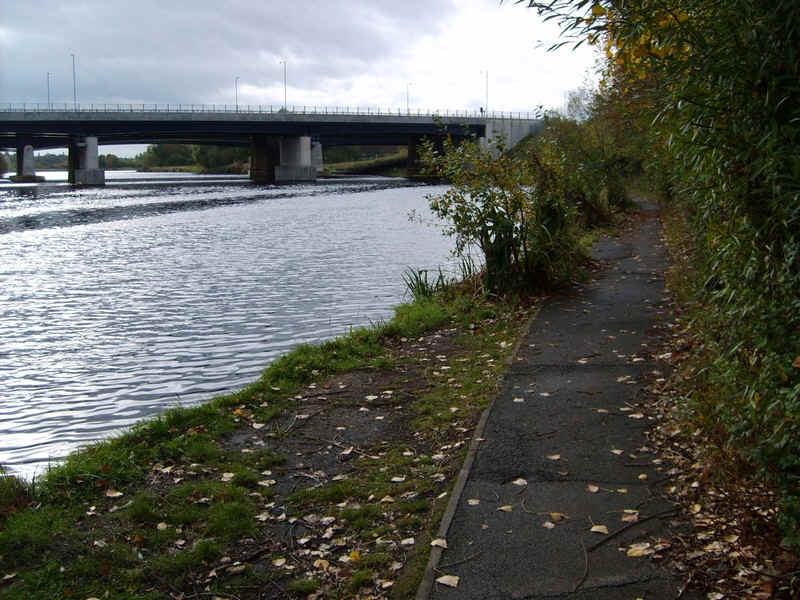 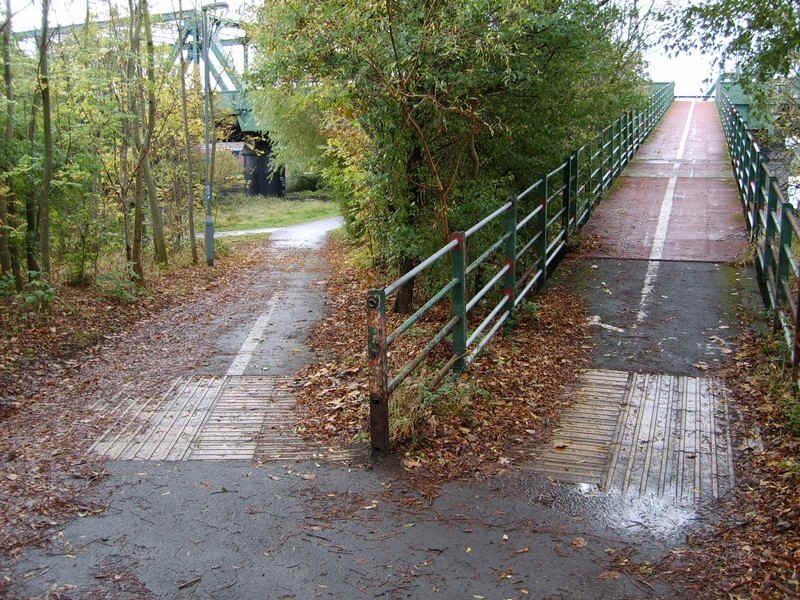 The riverside path begins to look more promising as it reaches the railway and A66 bridges. 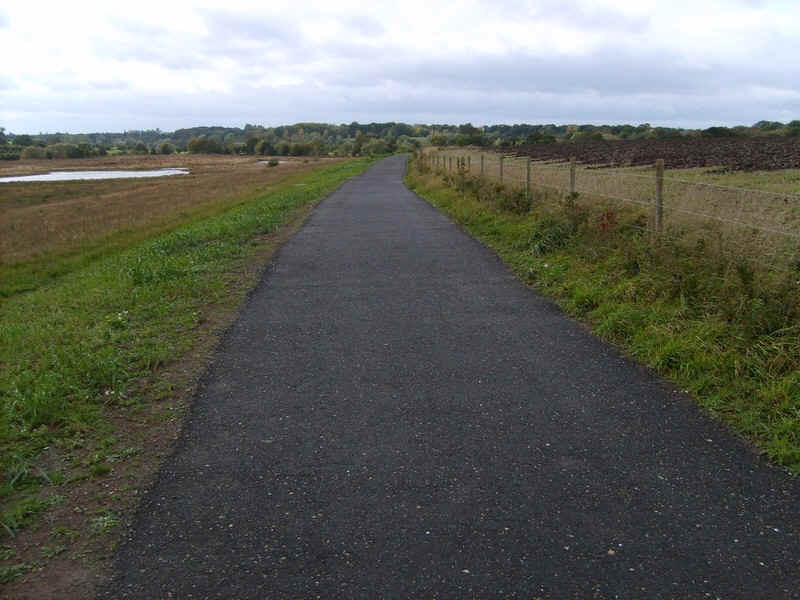 At last........out into the country. 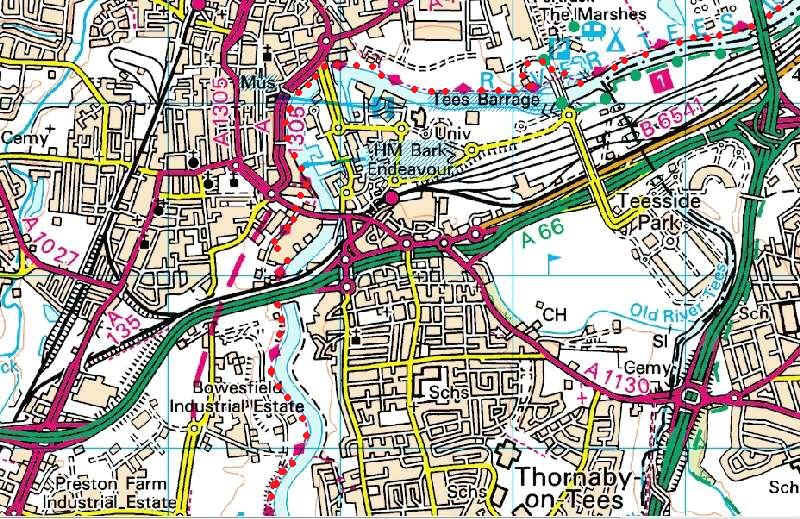 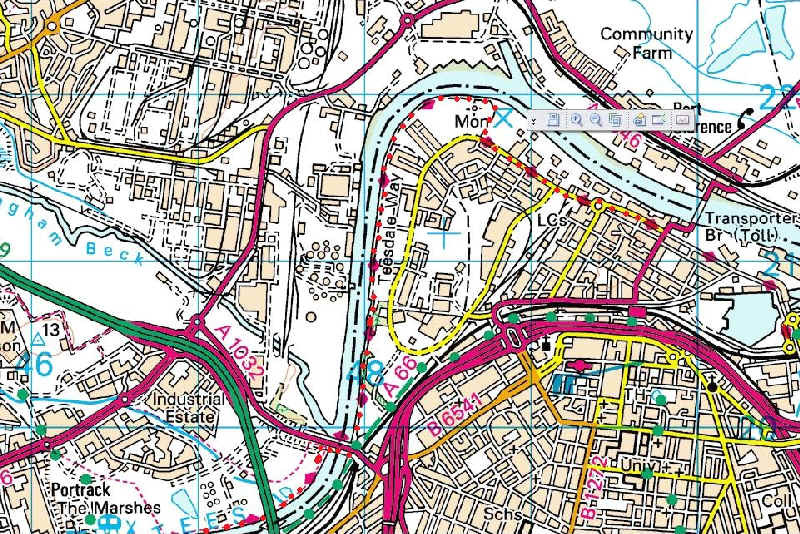 As can be seen on the map, the Tees now enters a series of meanders which the riverside path follows closely. 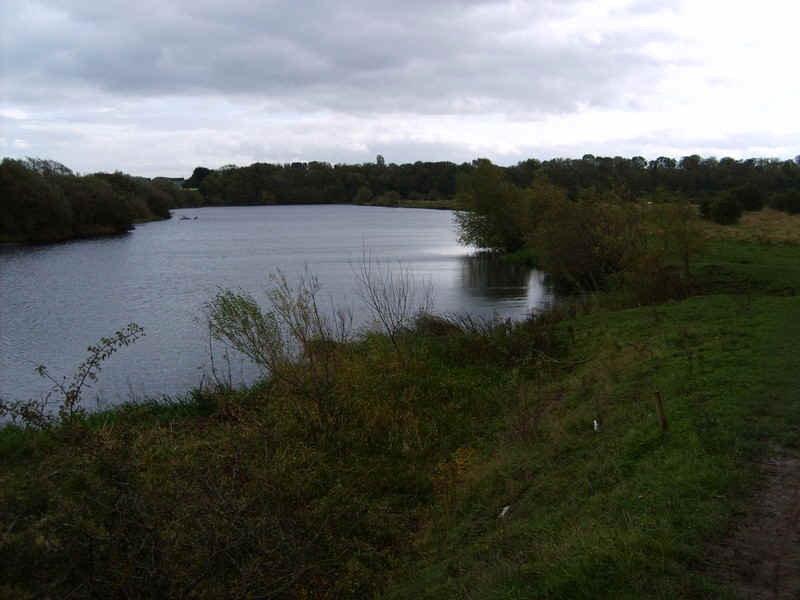 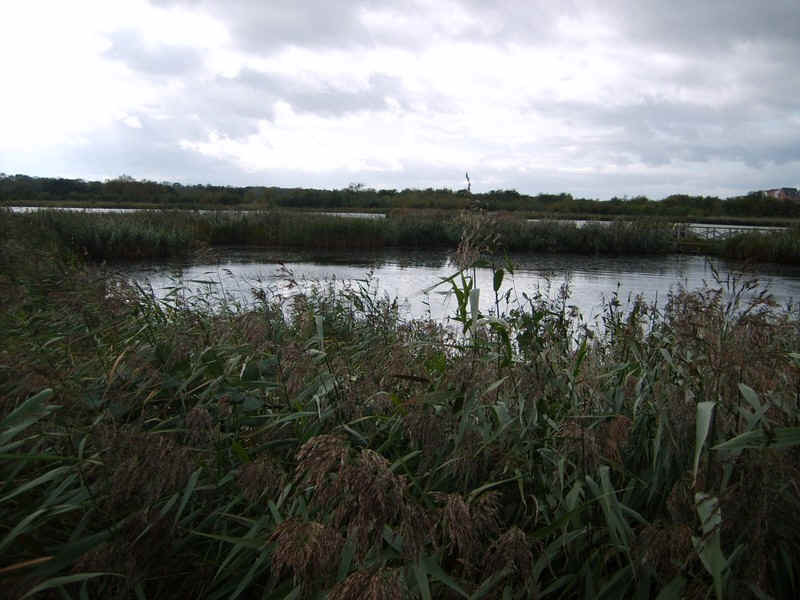 One of the effects of the barrage was to make some land change from meadows into marshes. 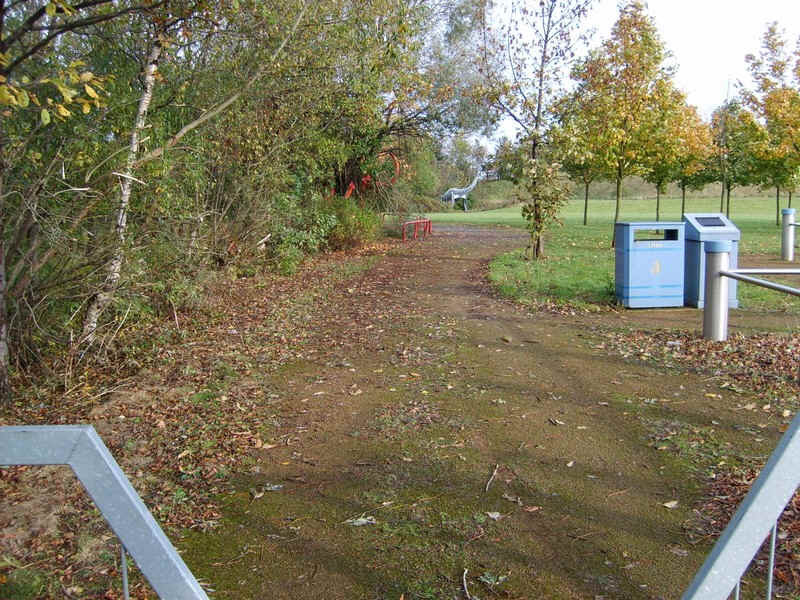 This has now been turned into the Bowesfield nature reserve, complete with paths and benches. 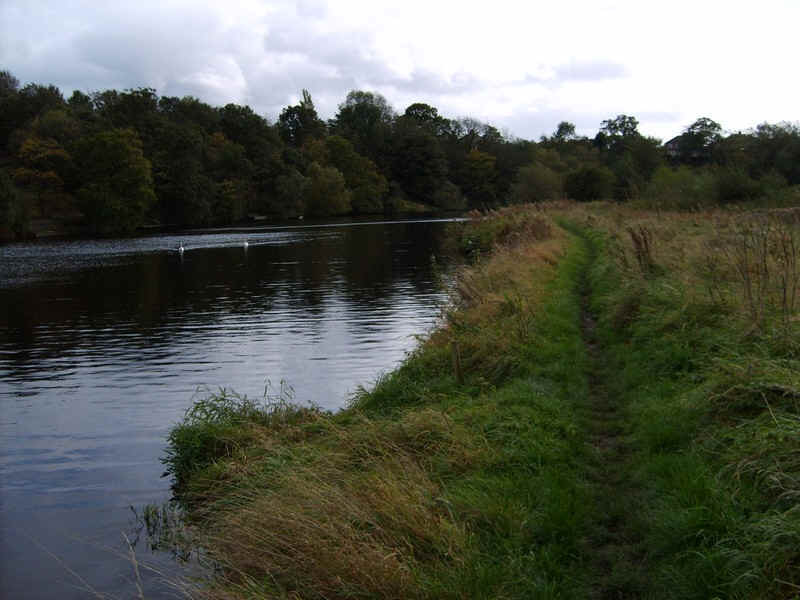 This is more like what a riverside walk should be like: a broad river, trees along the banks, a clear path and some swans. 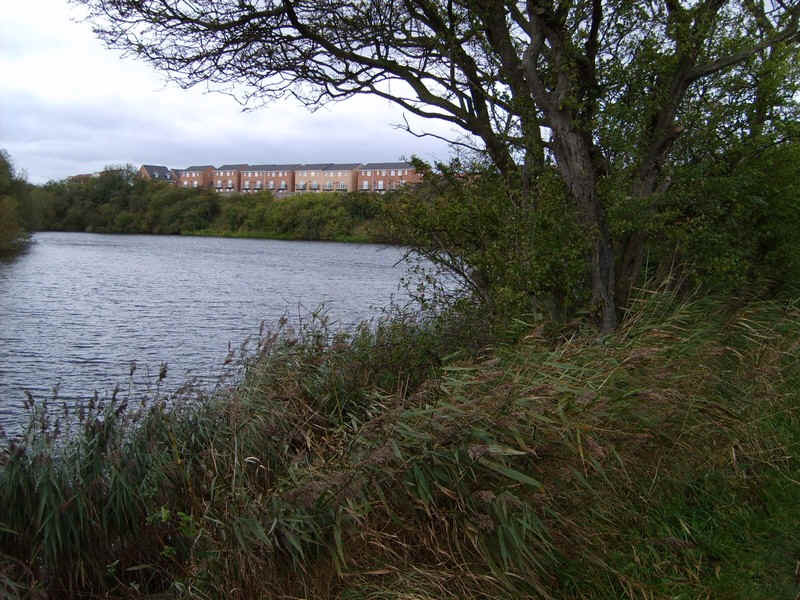 Obviously, the housing developers have decided that the view needs to be improved. 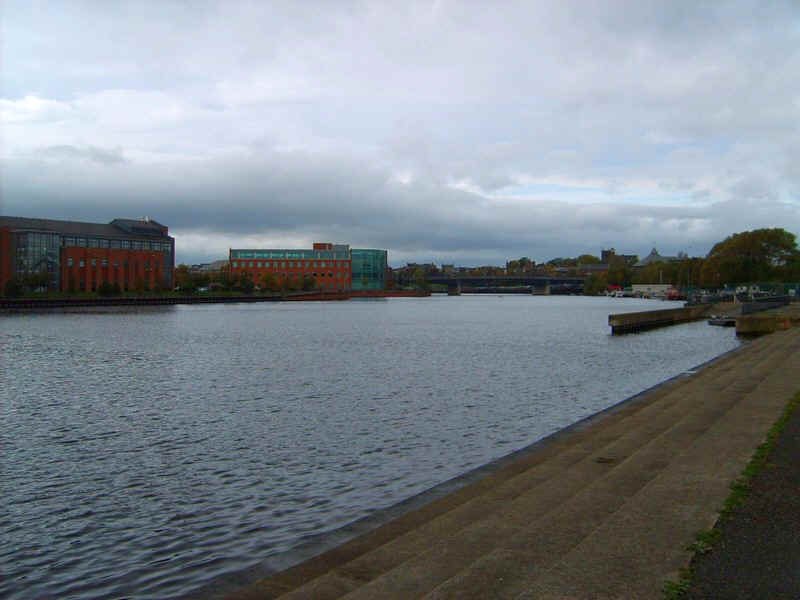 Note the balconies on the second floor - I hope the trees don't grow too much! 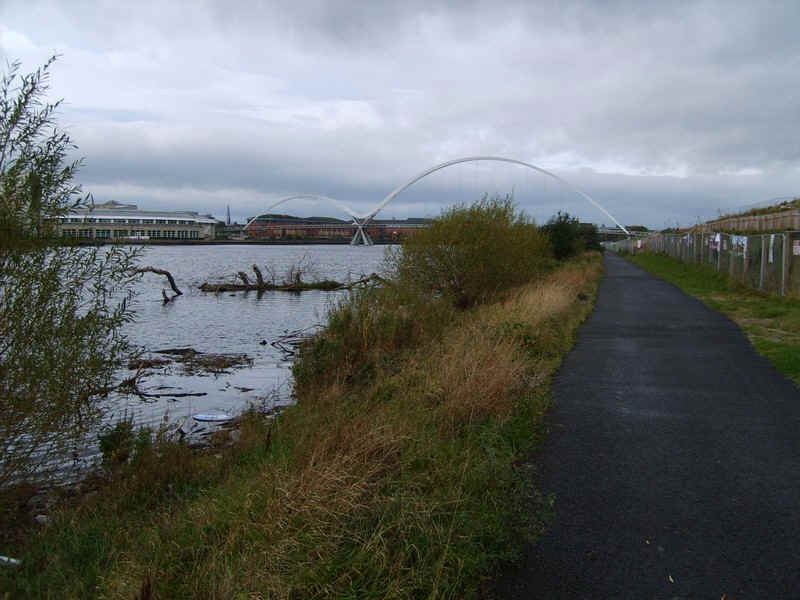 .....before the Teesdale Way reaches a new road bridge. 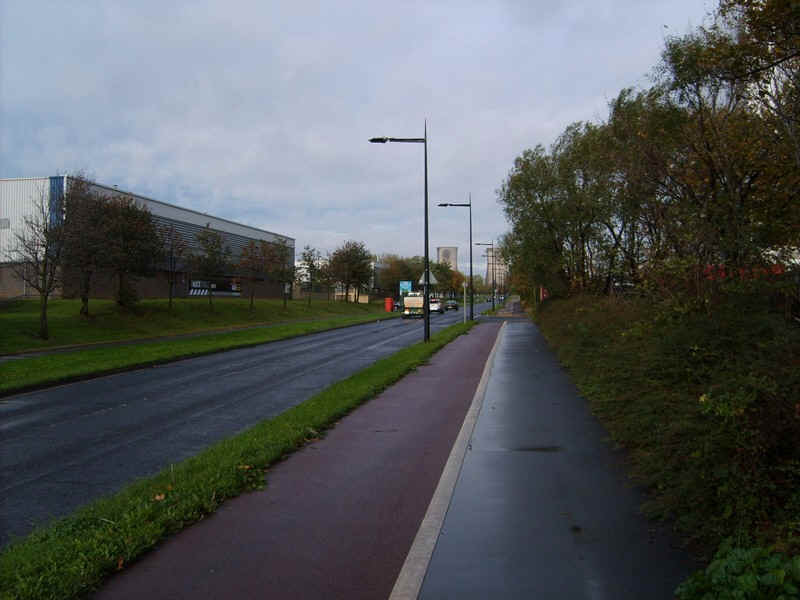 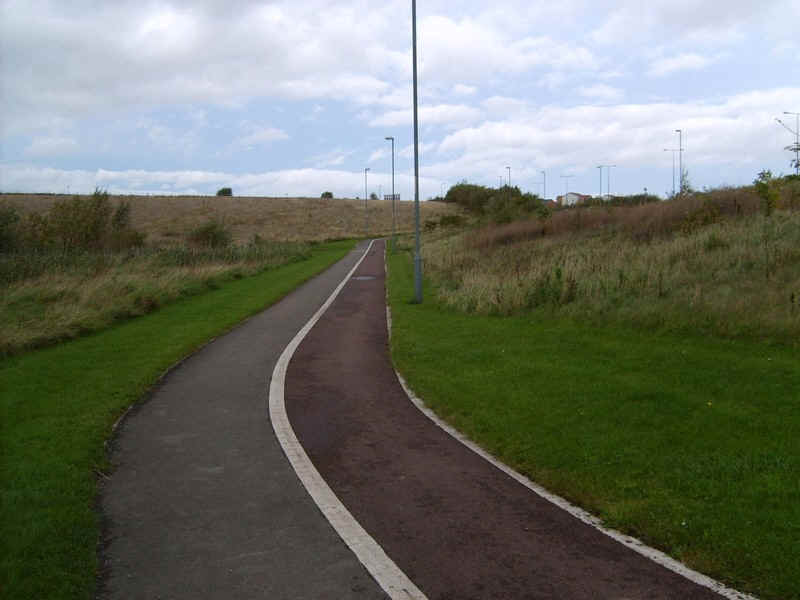 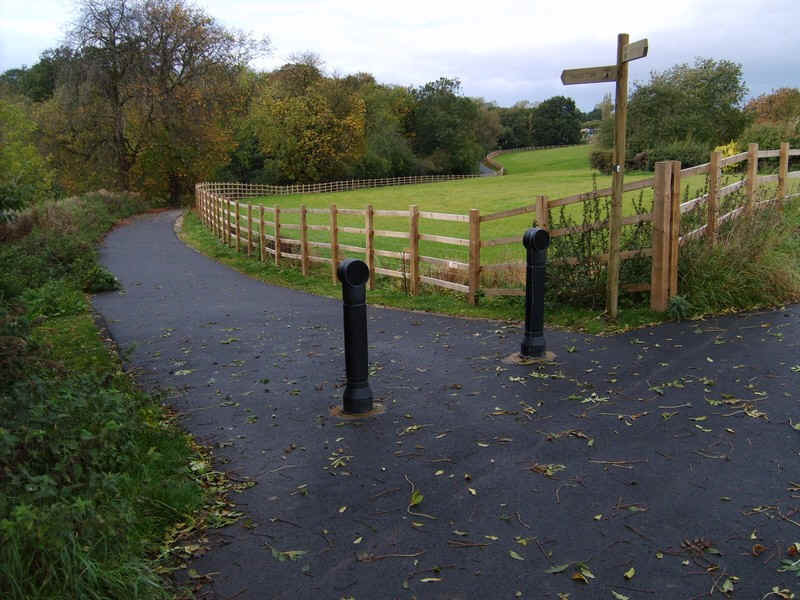 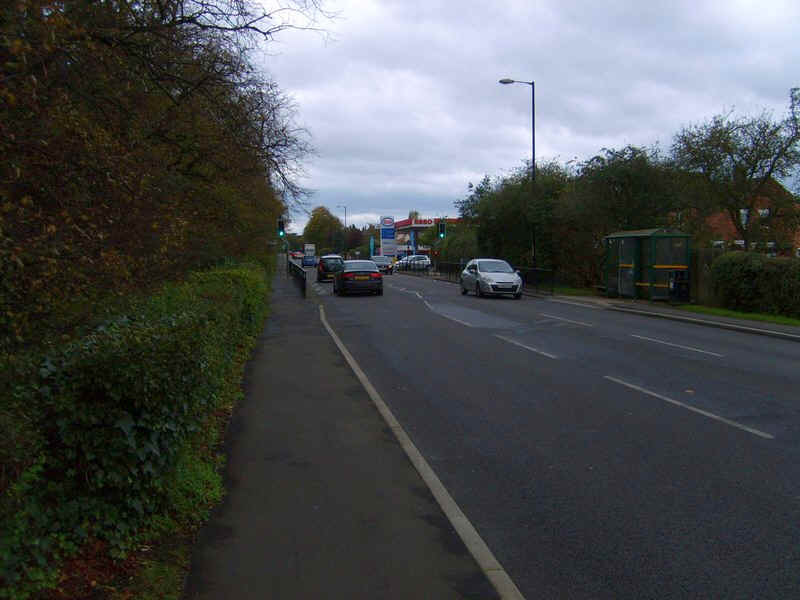 .....so it's up a cycle track..
.....to join a paved lane. 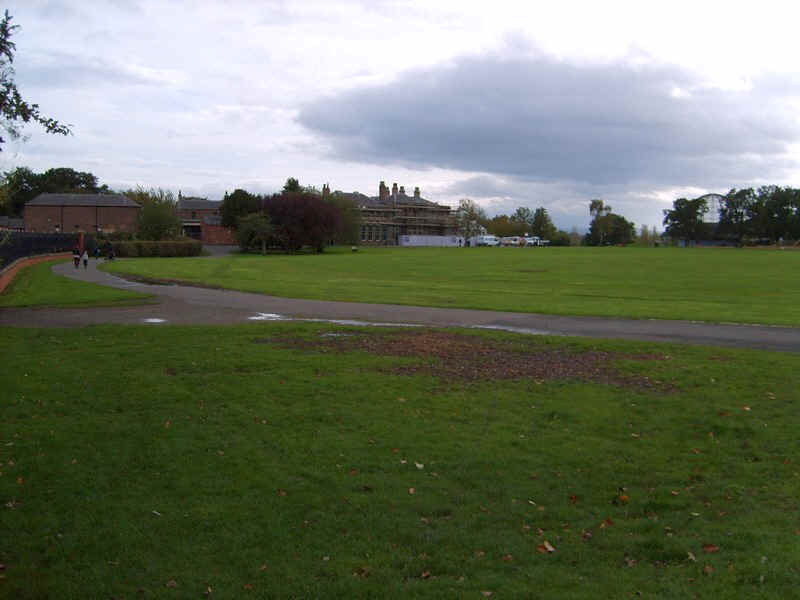 .....with its Hall and Museum. 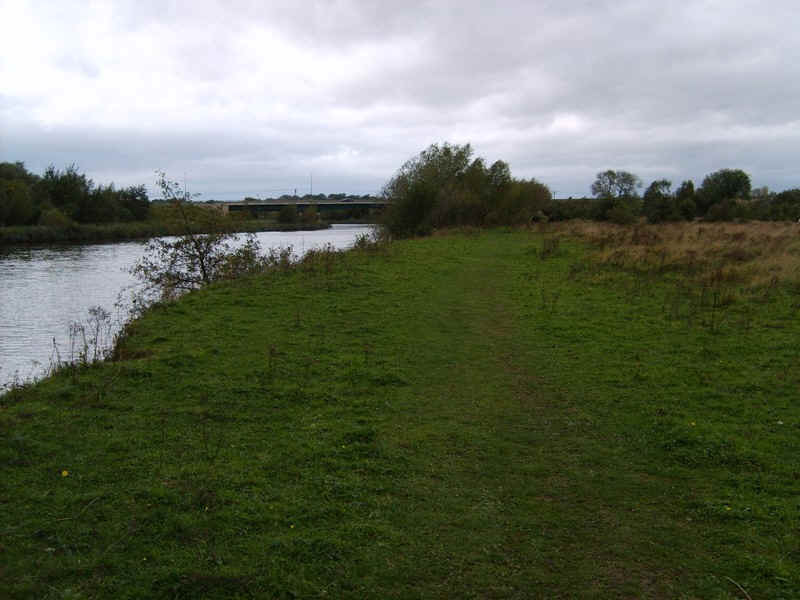 After visiting the park, rather than following the riverside path I headed along the main road to Eaglescliffe railway station and the end of the second stage of my walk.